The annual event for poetry lovers, the Shankar-Shad Mushaira organised by the DCM Shriram Group, is back with its 53rd edition in Delhi. The mushaira was held recently at Modern School, Barakhamba Road. The Chief Guests for the occasion were Mr. Pavan Kumar Verma, Former Member of Parliament & Hon’ble Justice Aftab Alam (Retired) and Syeda Hameed, Social & Women’s activist and former member Planning Commission of India. The mushaira is held every year to commemorate the memory of Shankar Lall and Lala Murli Dhar who are known for their contribution to the social, educational and cultural life of New Delhi as patrons of Urdu poetry. 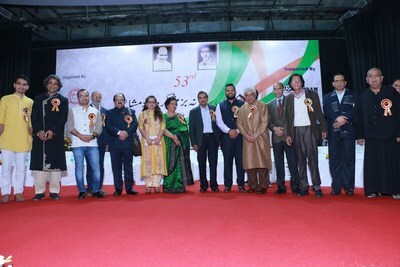 This year’s edition of the mushaira witnessed the participation of renowned Urdu poets including Javed Akhtar, Munawwar Rana, Prof. Waseem Barelvi, Dr. Popular Meeruthi, Manzar Bhopali, Dr. Rahat Indori, Dr. Iqbal Ashhar, Dr. Gauhar Raza, Sheen Kaaf Nizam, Dr. Kaleem Qaisar, Azhar Iqbal, Noumaan Shauq, Hussain Haidry, Swapnil Tiwari, Ms. Azra Qaisar Naqvi, Aqib Sabir, Vipul Kumar and Dr. Nusrat Mehdi. The Annual ‘Shankar-Shad Mushaira’ is a legacy to commemorate the memory of Shankar Lall & Murli Dhar of the DCM Conglomerate, who are known for their contribution to the social, educational and cultural life of New Delhi, as the patron of Urdu poetry. Mushaira will showcase the well-renowned Urdu poets who would be reciting their best poetry or shayari alongside young and promising poets who will get an opportunity to present their craft before the Connoisseurs. The famous Shankar-Shad Mushaira is inseparable from the cultural life of the capital. The event is scheduled to take place under the umbrella of ‘Shankar-Shad Mushaira’, a literary event, held regularly by the Shankar Lall Murli Dhar Memorial Society. The Shankar-Shad Mushaira, an initiative of the DCM Shriram Industries, has been promoting Urdu mushaira as a genre of literature and oral art since 1953. For more information, please visit: http://dcmmushaira.com/ .